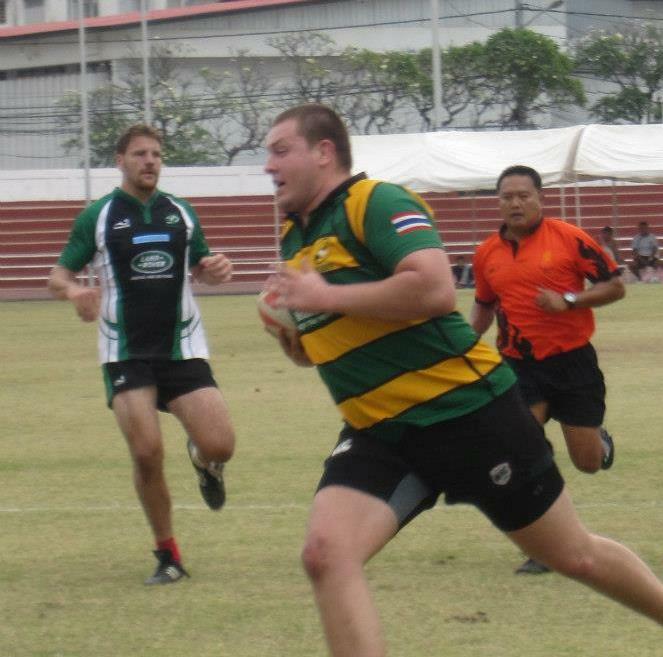 Rugby: 2013 Laos Tour Report – Champions! The travelling party up to Laos was split into two groups; those who flew up on the Friday, and those who took the train (the good-looking half of the team). With our first game scheduled for 11:30am, it was always going to be touch-and-go whether or not the train party would arrive on time. We didn’t. Our train arrived three hours late, which was perfect for Young Master Dan, who managed to get a few more pages of studying in before disembarking. The first game for the Southerners, against Mahasarakham Technical, would have to be played with a 12-man squad. A resounding 36-7 victory for the Southerners would set the tone for the rest of the weekend; we were here to do business. The next game would be against the Vientiene Buffalos. Very similar to the opening game, it was a Southerners dominated affair. We led from the start and never looked like losing. The moment of the game came in the dying seconds, when Young Master Dan scored his first try in Southerners colours (that’s colors for you Americans). 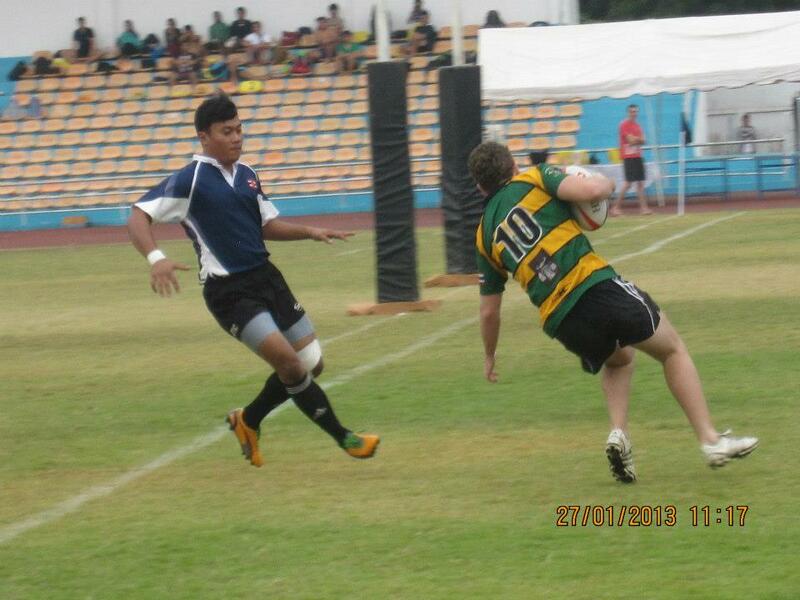 Receiving a pass from Jean, he had a clear path to the try-line, 15 metres away. Not one to pass up a challenge, Dan managed to change his course, directly into the nearest defender with a resounding thump. Utilizing his speciality, the powerful leg thrust (perfected after the many hundreds of photos he takes of himself holding his dogs down with his feet), he battled his way over the line. 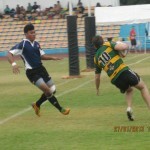 A richly deserved try after the effort he has been putting into practices. A fine day’s rugby over, it was time to strip down to our underpants and get wet i.e. swimming pool fines session. On the menu were 6 or 7 cases (slabs?) of Beer Lao, and one of those bottles of extremely strong vile bottles of alcohol that the Southerners love. With Bleasy standing regally in his white hotel bathrobe at the head of the pool, the scene was set. All good fun, but I think everyone will admit that we had a rather poor showing at that fines session – consuming only 3 or so cases and not even finishing the vile liquid. I suppose Jean did tear off Jim’s underpants and throw them off the balcony onto the road, which was fun for everybody except the unsuspecting passers-by on the road. Jim had to borrow a bathrobe, and Kenta had to retreat into the shadows of the pool to hide his excitement. The next day dawned with surprisingly few debilitating hangovers. The emphatic performances of day one seemed to have sparked an element of seriousness into the team, with the prospect of a tournament victory on the horizon. A short chronology of events goes like this; we conceded a penalty from the kickoff. The Navy decided to take a quick tap. Martin was waiting for the man, ready to make a big hit. The hit came quicker than expected for the Navy fellow. What’s the point of retreating 10 metres when you can retreat half a metre? 30 seconds later and Martin was involved again. After an attempted charge-down, he unfortunately came into contact with the small fellow who had kicked the ball, leaving him lying flat on the ground, writhing in agony. Martin wasn’t really in the wrong here, but unfortunately the Oscar-winning performance of the opposing player (a mixture between Maximus Meridius’s death at the end of Gladiator, and’ Muppet’s in Space’), was enough to put him in the sin bin. This only served to fire up the game even more. Credit must be given to the Thai Navy’s coaching staff, who with their added theatrics and ‘Hold me back!’ moments, made for a very entertaining game. Aside from that, we played some quality rugby and came away with a narrow victory, our toughest and most deserved one yet. To be honest, I can’t really remember much about the final (I think my hangover had started to kick in by then). I remember it was a very tight affair, with the result in the balance until the last minute of the game. I only know two things for sure; Darrel said the word ‘clown’ at least three times, and we won the game. Thus, we were crowned ‘Champions of Laos’, with great pomp and ceremony. We stuck around for the prize giving, Bleasy going up to accept our ‘beautiful’ wooden trophy, and Sod going up to get a photo taken with the hot photographer. All in all the Southerners tour to Vientiane was a great success. A 5-0 record, leading us to our first trophy, in our first tournament of the year. I was really impressed with the team effort and continuity throughout all the matches over the weekend. Minimal selfish play, great support play, and great ‘gees’ (it’s an Afrikaans word).